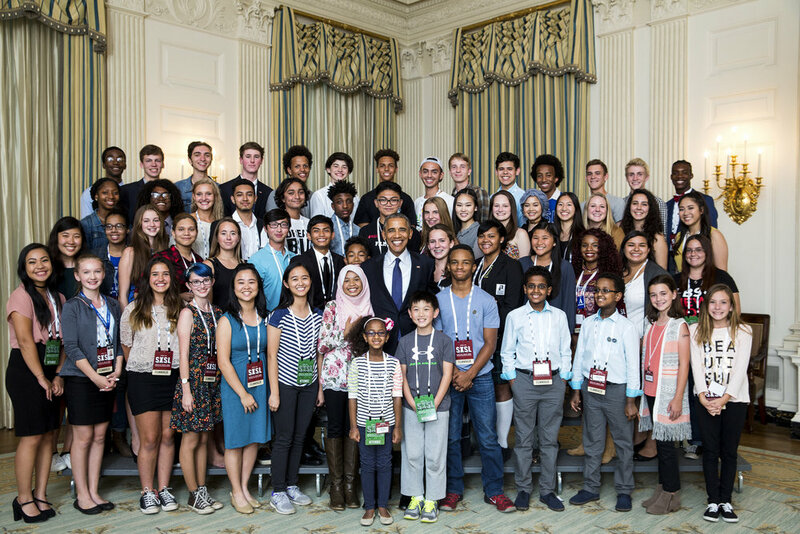 Above: Barack Obama, the 44th President of the United State, with Student Film Festival winners from across the United States on October 3, 2016. Below: From Harlem to the White House is a 7-minute film that describes the six students trip to the White House. The Digital Media Training Program's Youth Empowerment Television program at the A. Philip Randolph Campus High School in Harlem, New York. Six students attended the ceremony at the White House on October 2nd and 3rd, 2016. See the winning film below. For the third year in a row, the students of the Digital Media Training Program are among the winners of the White House Student Film Festival. This marks their second trip to the White House. The theme for this year's films: "The World I Want To Live In." In addition, First Lady Michelle Obama made a special request for films that address the lack of educational opportunity for girls (see below). Worldwide 62 million girls don't attend school because of religion, tradition, safety and poverty. In this winning film, A Girl's Right To An Education, fourteen-year-old Youth Empowerment Television reporter Nathalie Cabrera was shocked by the kidnapping of 276 Nigerian girls in 2014 by Boko Haram. She could not believe that the group was against secular education for girls when most experts tell us that the education of girls uplifts the whole community. Nathalie was inspired to examine the issue of girl’s education around the world. In this film she profiles three groups that are working to better the lives of girls: Pathfinders Justice Initiative, Girl Be Heard and She’s the First. She imagines a world where girls have equal access to an education. First Lady Michelle Obama makes an appeal for films on girls' education. 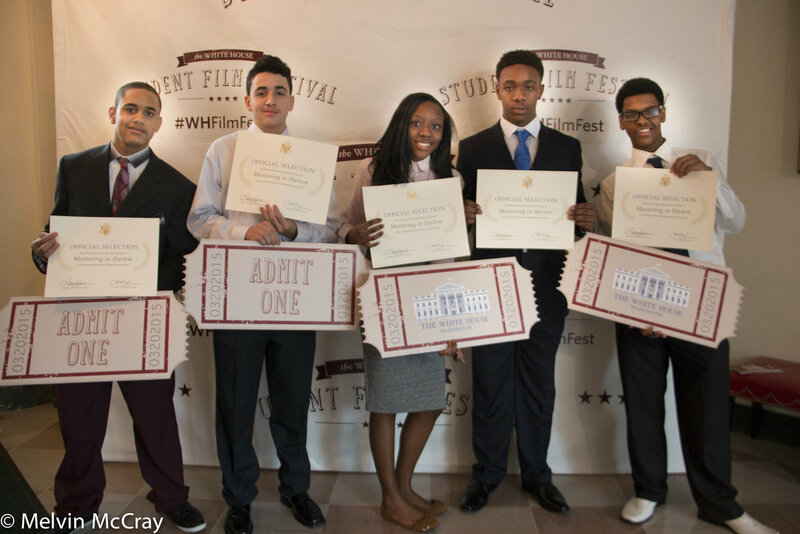 The students of the Digital Media Training Program in Harlem (DMTPH) were among 15 winners of the 2nd Annual White House Student Film Festival. The subjects of last year's films were mentorship and community service. Their 3-minute film, Mentoring in Harlem, examined the issues of mentorship by talking to mentors and mentees in their community. The film highlighted the Impact Repertory Theater, Deep Dish TV Project: Green Screen, Blue Nile Rights of Passage, the Mama Foundation for the Arts and the Friday Night Live program at the Riverside Church. The 15 films were selected out of a 1,500 entries from around the country by the American Film Institute. President Barack Obama honored the K through 12th grade students at a White House screening hosted on March 20th, 2015. The DMTPH was started in 2013 by Columbia Journalism School Adjunct Professor Melvin McCray in order to teach high school students in Harlem video, photography and journalism. The Harlem Through My Eyes History Project was launched as a vehicle for collecting and disseminating oral histories of people who live and work in Harlem. To date, we have recorded over 40 interviews including Harry Belafonte, Anna Maria Horsford, Herb Boyd, Dr. Rosiland Jeffries and Rev. James Forbes. Many of the interviews can be viewed on our website (see Harlem Through My Eyes page). The Harlem Through My Eyes song was written and produced by recording artist T. L. Cross exclusively for the DMTPH. The program operates under the auspices of Board for the Education of People of African Descent, a non-profit organization that operates the John Henrik Clarke House and was founded by New York State Regent Emerita, Dr. Adelaide Sandford. The DMTP has partnered with the A. Philip Randoph Campus High School, New Explorers High School, the Riverside Church, Columbia University and My Image Studios LLC. When it comes to emotions, Professor Melvin McCray considers himself to be pretty much an unflappable guy. So consider his surprise when he not only felt goose bumps, but the earth move under his feet as he stood in the East Room of the White House that was transformed into a movie theatre for a special ceremony. The thing that caused the flap was not so much about his achievement but that of the nine students in his Digital Media Training Program in Harlem (DMTPH) who were being honored as one of the winners of President Obama’s second annual White House Student Film Festival. The Harlem high schoolers ages 13–18, were among the 15 winners selected from a field of 1,500 entries in the national competition launched by the White House last year and featuring short films focused on the “Impact of Giving Back.” Their 3-minute winning documentary called Mentoring In Harlem took a look at five mentoring and community service programs in their neighborhood. Last year, McCray’s students submitted a film called Harlem Through My Eyes to the inaugural film festival and gained an honorable mention. This proved to be more than enough to fuel the enthusiasm of the young mediamakers whom McCray vehemently encouraged. “At first when I told them that next year we could win this thing, they looked at me with skepticism,” said McCray. “But I insisted that they imagine themselves being in the White House as winners. They obviously heeded this advice because, what was to many a pie in the sky dream became a prize reality." Their winning entry featured five Harlem mentorship programs: Blue Nile Rites of Passage, Impact Repertory Theater, Mama Foundation for the Arts, Deep Dish Green Screen and Friday Night Live at The Riverside Church. “This film was a big accomplishment for me,” said Jared Collazo, “because it shows that I can be great at what I put my mind to.” Hannah Coleman said that before the film project, she was “. . . unsure of who and what I wanted to be. Now I’ve found confidence in myself and my dreams,” she declared. Most of the students in the DMTPH reside in the Grant Housing Project in Harlem made even more notorious last year with the arrest of 100 young people for gang activity. “This is a positive story to come from the Grant Houses and I hope that it is one that resonates as loudly as the negative ones we hear all the time,” said McCray. Students David Maxwell, Chazz Johnson and Digital Media Training Program Director, Melvin McCray, appear on MSNBC's Melissa Harris-Perry Show on Sunday, March 22, 2015. Melvin McCray appeared on WABC Channel 7's Here and Now Show on Sunday, August 2nd, 2015, along with two of his Digital Media Training Program students, Jared Collazo and Daviid Maxwell. They talked about their 2nd Annual White House Student Film Festival win and their experience at the ceremony in the East Room hosted by President Barack Obama. In February of 2014, the students at the Digital Media Training Program in Harlem (DMTPH) won an "Honorable Mention" in the first-ever White House Student Film Festival for their film "Harlem Through My Eyes: Digital Technology Meets Oral History". The subject of the 2,500 film entries was science and technology in the classroom. The DMTPH students used digital technology and oral history to chronicle stories of Harlem's past and present. This program trains young people in 3D animation, video, photography, journalism and oral history. While learning digital media skills the students are creating the Harlem Through My Eyes History project, a multi-media exhibit, website, photography book and video documentary that examines the community of Harlem through the eyes of the people who live and work there. The program is collaborating with My Image Studios LLC and the Riverside Church with funding provided by a grant from the West Harlem Development Corporation. Melvin McCray, adjunct professor at the Columbia University Graduate School of Journalism, is the Program Director as well as the video and photography instructor. The program was assisted by Rev. James Singletary, former Director of Children, Youth and Families at the Riverside Church and Alexis Moses, a 3D animation instructor.